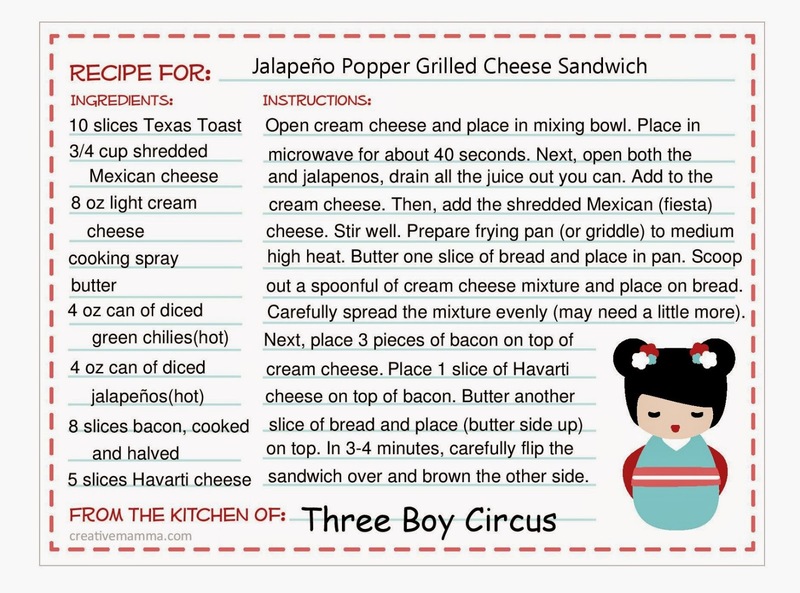 Three Boy Circus: Happy National Grilled Cheese Day! In honor of today being National Grilled Cheese Day I decided to try a different sandwich. I've heard of several different kinds of grilled cheese sandwiches, but when I asked my boyfriend's opinion, it was decided that I would conjure up a jalapeno popper version. My boyfriend's view of poppers is the hotter it is, the better it tastes. So the following recipe is for a hot version, but you can definitely forego the jalapenos and just use canned mild chillies (I did make this version and it's still yummy without the heat). I apologize for not having the time to adapt this for smaller servings. This recipe will yield about 5 sandwiches. The cream cheese mixture will be fine as leftovers a couple days later! I used light cream cheese because I imagined this sandwich would be pretty tasty and fattening so wherever I could cut fat, great! :) Also, please note that both cans are HOT. Fiesta blend (or Mexican blend) cheese. This is before adding the shredded cheese. Try to spread the mixture evenly and not too far to the edges. Lay that yummy bacon on the cheese mixture like so! Place the Havarti cheese on top. This was my first time having this cheese and it's amazing! BTW I found this at Costco! This is how I like my grilled cheese sandwiches to look. Not too brown, just enough. Ta-dah! Look at that beautiful sandwich! Enjoy (just make sure you have milk handy)! This recipe card template is available for free from Creative Mamma! Oh my goodness, that looks amazing!!! I just tried jalapeno poppers for the first time last weekend And I'm hooked, will definitely have to try this recipe sometime!